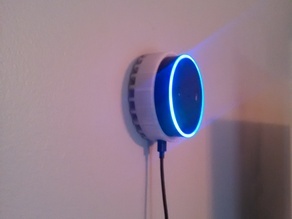 This is a nice wall mount for the Amazon Echo. The mount holds the dot tightly (I'd actually prefer it be a little less tight). My audio cable was too big to fit through the cable hole, so I bought a smaller cable. I'd suggest making a little more room for the wire pass-through area. I find the speaker easy to hear when mounted, and the microphone works well from about any angle I have it mounted on a wall between rooms, and voice control works in both rooms, as well as down the hall.